Adult and Pediatric Allergy and Asthma Specialists (Garden City) - Book Appointment Online! 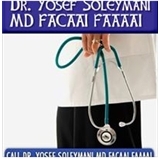 Dr. Yosef Soleymani treats adult and pediatric patients for all their allergy, asthma, and immunology needs. He believes you deserve to enjoy every day to the fullest. Dr. Soleymani understands that seasonal/environmental and food allergies are becoming more common in both adults and children; thus, he strives to alleviate you and your family from allergies and related immunologic conditions.